I recently acquired 4 nice pieces of early iron lighting from a local estate of a long-time collector. Here is a lovely 18th century 4-arm candle holder. 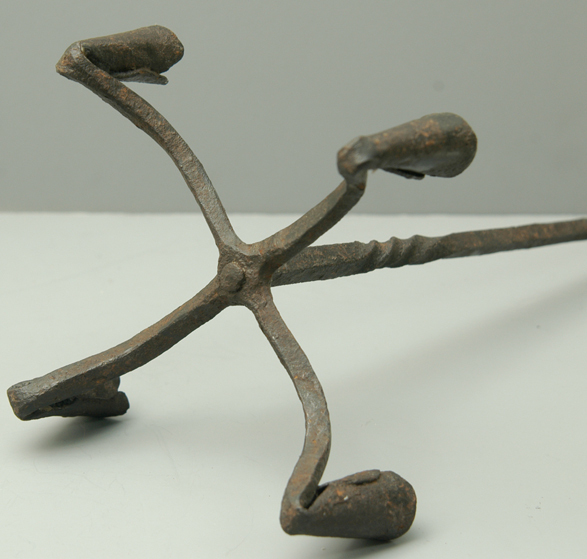 Wonderful curled hook with a curlicue end, twisted rod (twisted in two places to offset the straight four-sided rod in between), and curved single piece with the four arms. The bottom of the candelabra (the four arms) is riveted to the rod. The candle cups are simply made, each with a wonderful overlapping seam facing inward towards the center. 19" tall x 9" at the widest. Set on a table, it cants slighting, but you will never notice that as it hangs. The piece has surely canted slighting since it was made as it is all quite tight with no repairs that I can find. The first discovery of American bog iron was made in 1630 near what is now the town of Saugus, Massachusetts. 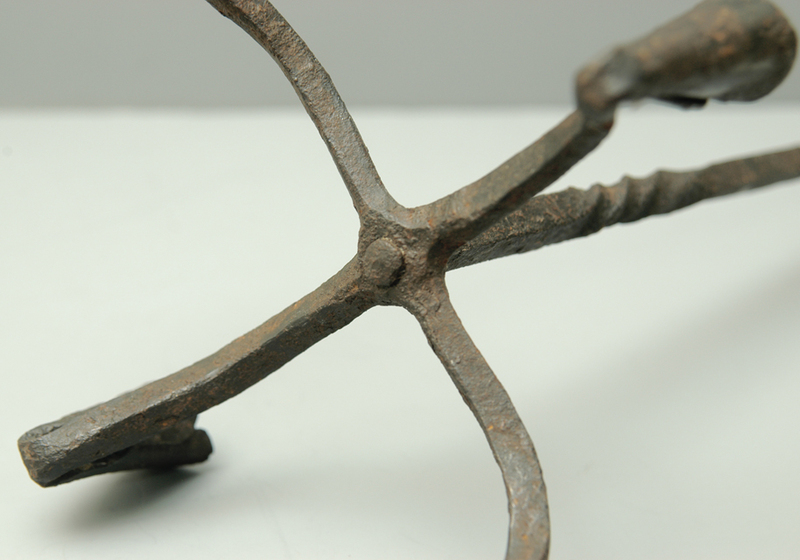 A primitive smelter was built and Colonists began to manufacture iron utensils and probably Betty lamps like the ones they first brought over on the Mayflower. As colonization spread through the colonies, so did iron foundries. 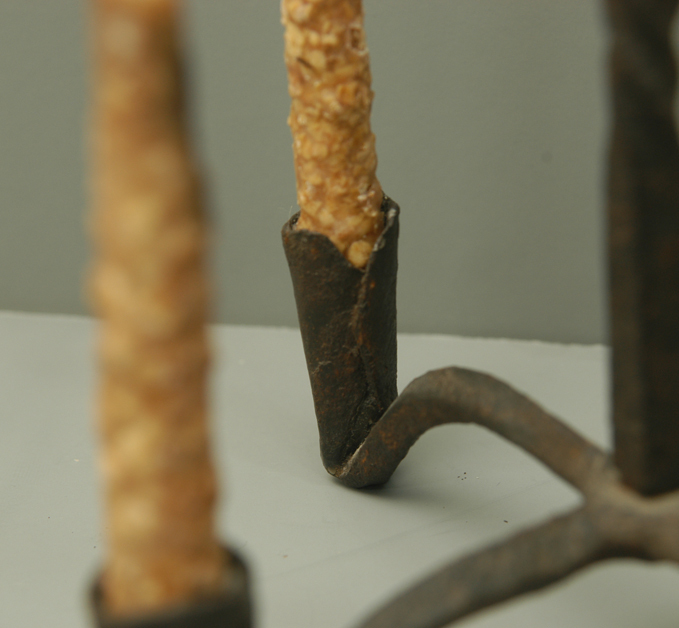 By the eighteenth century, grease lamps had pretty much been replaced by rush or splint holders and candleholders. Please note, however, I do not know whether this candleholder is American. It has features of some American-made iron lighting, but the great majority of the iron lighting that we have collected and loved for the last century or more were brought here from England and the Continent. 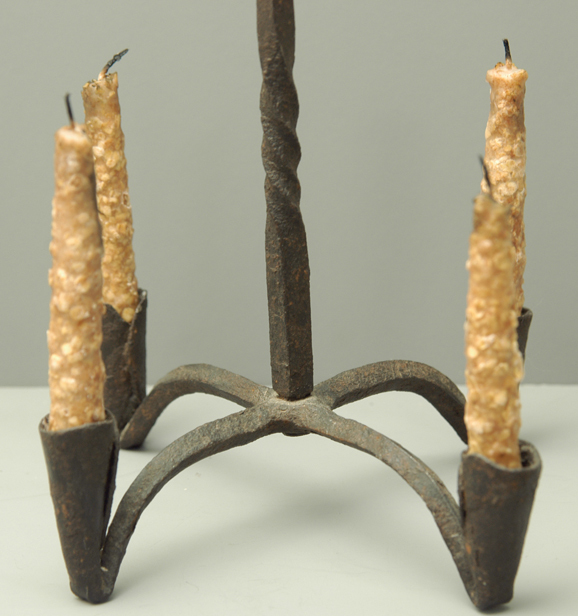 The candles don't come with the candelabra....they are some I bought at some show to use for decoration....they don't burn well anyway as they are rolled in oatmeal to give them the grungy look....the oatmeal will catch fire. This is a really lovely piece that will look great in any early setting. Circa 18th century.